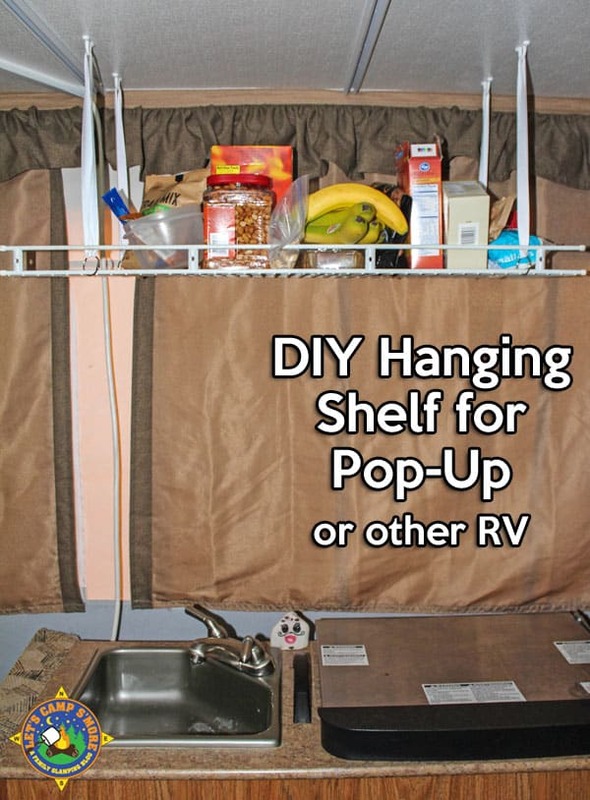 Add a hanging shelf to your RV with this simple sewing tutorial. We own a pop-up trailer. 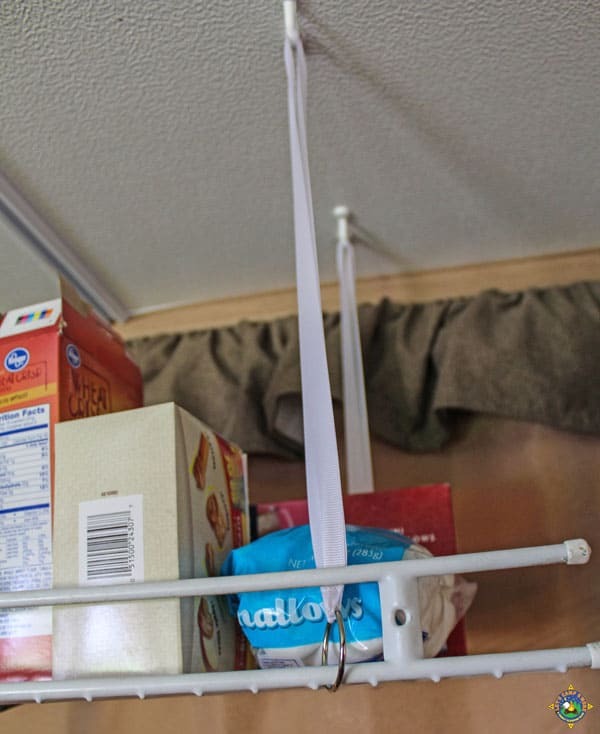 It has four loops attached to the ceiling for a hanging pantry. The pantry didn’t come with the used RV and I wasn’t willing to pay for a replacement, so I decided to create my own hanging shelf. 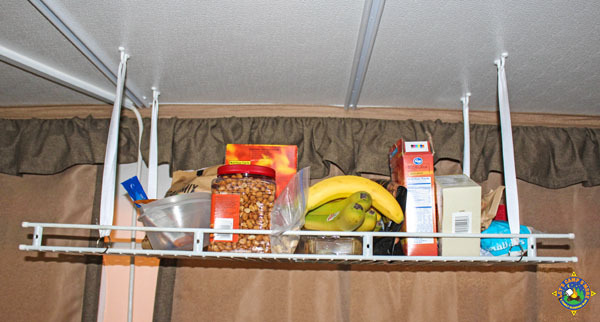 See how easy it is to make a hanging pantry shelf for your trailer. 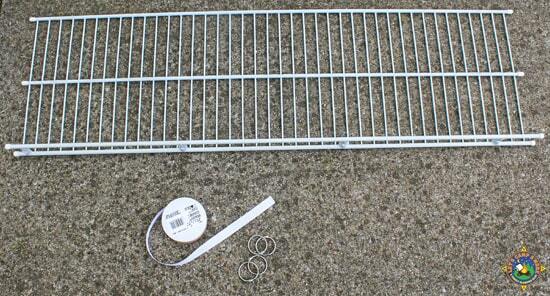 Determine how far down you want your shelf to hang. Cut four ribbon pieces double the length of the hanging length. I wanted mine to hang down about a foot and a half, so I cut four 2.5 foot pieces. Fold up about 1” of the end of each ribbon and sew in place along the top edge. This will form a loop to put the book ring through. Repeat this for all eight ends. Loop the ribbon through the loop in the ceiling. 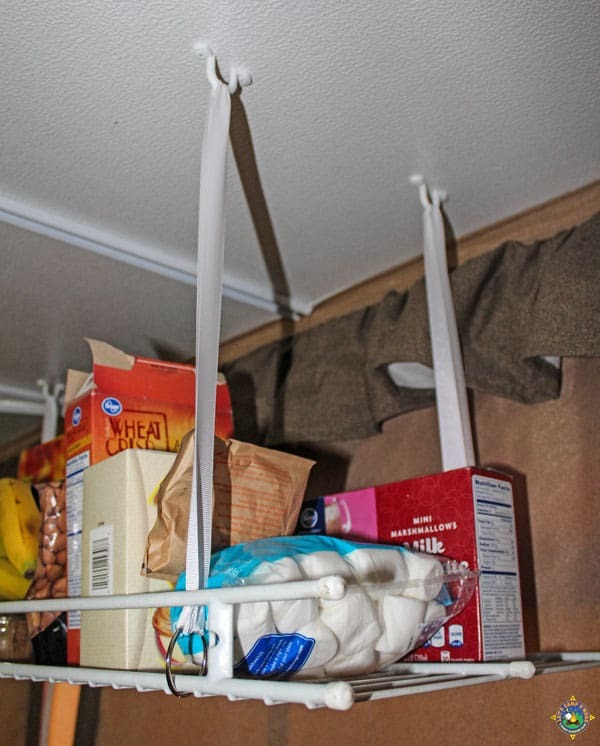 Open a book ring and place it through both end loops of the ribbon and close over the outside edge of the wire shelf, making sure to evenly hang it. How simple is that? Our shelf hangs over the inside kitchen in our pop-up trailer. We store snacks up on the shelf. It’s easy and convenient. The shelf can be taken down and the ribbons left up between set-up. We will be taking a 3-week trip next month that will have us camping in 8 different campgrounds. That is a long time to be gone in a pop-up. This shelf will help us keep everything organized inside our trailer. How do you keep all your possessions organized in your camper? 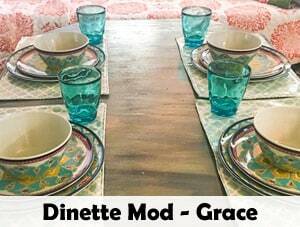 What a great way to maximize space in your camper. Thanks for sharing at Merry Monday. Hope to see you next week! Those little loops were attached to the ceiling when we got the trailer. We believe there originally was a cloth pantry box that hung there.